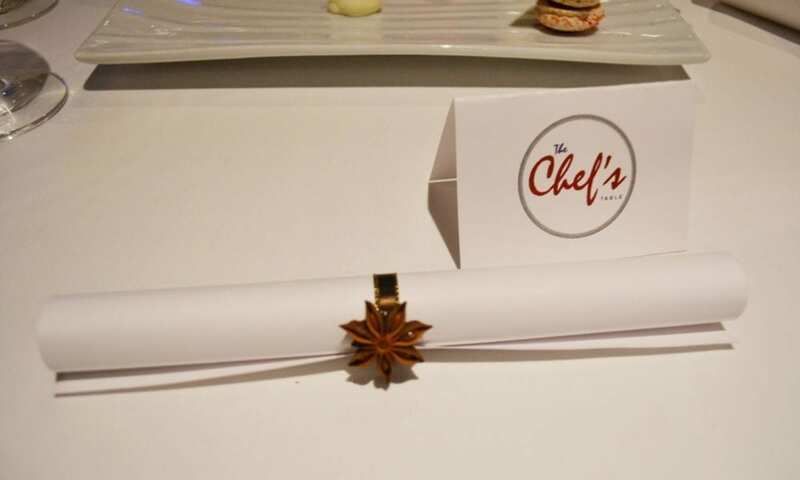 The Chef’s Table is the most exclusive spot onboard every Carnival Cruise Line ship. It consists of a multi-course meal including appetizers, an entrée, dessert, and wine. The Chef’s Table dinner will run you $75-$95 depending on which ship you are on, plus an automatic 15% gratuity. But I wanted to do it at least once, which is why I made a reservation on my recent cruise aboard Carnival Inspiration. When I made my reservation, the actual date the dinner would be taking place was “TBD,” which was fine. I was aware that this is always the case but hoped it wouldn’t fall on a formal night. On my little three-day cruise, I knew there was about a 50/50 chance it would be. Ultimately, this was preferable as I otherwise would have missed the Halloween festivities that were held the last night of the cruise. The evening of embarkation day, I received a phone call in my cabin confirming my reservation and informing me of the day it would be taking place. This was basically my last chance to cancel and not be subject to a cancellation fee of $25 per person. I then received a letter that stated when and where to meet for the dinner. On the Inspiration, we were all told to meet up in the atrium lobby. Upon arrival, we were each given a glass of sparkling wine. This made my bringing a drink with me a bit of a mistake, but not the end of the world. Once everyone had arrived and finished their wine, we headed as a group to the galley. We arrived at a table in the pastry area of the ship that was already set up with the ingredients for Carnival’s Warm Chocolate Melting Cake. The Chef demonstrated how the cake is made with the help of an assistant chosen from the group and told us that for a 3-day cruise, they make about three-thousand chocolate melting cakes! We didn’t get any cake, but we did get four amuse bouches, and were told a little bit about the process of making each of them. The menu has been updated on some ships, but for those who get the older menu that is still being served on the Inspiration, when they give you the Mango Sphere and tell you to put the whole thing in your mouth – do it! Otherwise, it will explode all over your nice clothes. The new menu is making its way to all the ships, but it’s being updated one ship at a time, which takes a while. After our tasty bites, we had to leave any unfinished drinks that we had brought with us behind. We toured quickly though the kitchen as the crew was hard at work to get our fellow passengers’ dinners out. We were then taken to the Library, where a large table was set for the whole group to eat together. The location varies by ship. On some, it’s in the galley, and on the Horizon and Vista there is a private room inside the kitchen specifically designed for the event. The ladies in the group were instructed to all sit on one side of the table and then our respective gentlemen positioned behind us to take a group photo with the chef. We were then sent to our assigned seats and were given a choice of red or white wine to have with our dinner. The head chef and two sous chefs plated our meals right in the library with us. The red wine choice was Banrock Station Cabernet, and the white choice was Ecco Domani Pinot Grigio. I was quite chatty throughout the dinner so I only made it through one glass of wine, but others’ glasses were refilled when they finished a glass. The menu, for our reference, was rolled up at each place setting. We were also served a bread basket and butter. Go easy on the bread – this meal that seems small really fills you up! We then had six courses, which were all delicious. I won’t go into too much detail since the menu varies by ship, but believe me when I say that this is a dinner that all will enjoy. I’m actually a somewhat picky eater, but ate all but one thing that was a garnish. You are able to state if you have any food allergies when you confirm your reservation. My pickiness is mostly texture-based (I don’t like mushy vegetables), so the menu was perfectly fine for me. Then, for some reason, there was a magician. I could have lived without this. I don’t get excited about magic and it put our meal on hold. This was more bothersome when I could hear the 80’s Party begin outside in the Atrium. I had wanted to attend the 80’s Party so this put a slight damper on the dinner. I was aware that the dinner was supposed to take two hours, but it ended up lasting almost four hours (the party started at 9 p.m.). We were finally served dessert which was a plate of sugary goodness… that we were basically too full to eat. I was so full, actually, that I took the macaron from my plate back to my cabin to enjoy the next day. Bonus: If you’re celebrating something, they will write it in chocolate on your plate! My birthday was earlier in the month, but it was also my excuse for booking the cruise, so I felt justified in telling them such. Another couple was celebrating an anniversary, which we learned from their plates! Lastly, we were each handed a Pixels envelope that contained a copy of the group photo we took and the recipe for the Warm Chocolate Melting Cake we had “helped” make in the galley. I’m pretty sure the recipe is published online, but it’s nice to have a physical copy to put in my recipe box. If I could go back in time and advise myself on whether to try the Chef’s table or not: Yes, I would definitely do it. I would just stop myself from bringing a drink with me and maybe not quite eat everything on every plate so that I could enjoy the dessert more. I do wish it didn’t take as long, but there might have been some kind of hold up I didn’t notice. My favorite items on the Inspiration’s current Chef’s Table menu were the Wagyu (beef), the Bisque Our Way (two different tomato bisques served side-by-side), and the Crab Stack (I divvied up my crab onto the three polenta crackers to eat it like bruschetta). But what about for a second time? You know, I thought that I would feel like once was enough (especially with the high cost), but the dinner was just so good! I would maybe even do the same menu again – but not every cruise, maybe not even every year. And, the new menu sounds even better, so it’s going to be hard not to sign up to taste that one eventually. Like I mentioned, they said to allow two hours, but you should expect that it takes the whole night – just in case. And you don’t get to pick which day it will be, so this could mean missing an activity you really wanted to attend. You are allowed to cancel within 24 hours without a penalty, so refer to the HUB app to see what’s happening when you get the confirmation call once you’re on board. I also mentioned this already: don’t bring a beverage with you that you don’t want to lose. Luckily I had Cheers! on this sailing, so there wasn’t a huge loss when I had to leave mine behind. Also, if you make a reservation, keep the multi-hour, wine-included dinner in mind when deciding whether to get Cheers! or not, as that was four hours that I wasn’t using my package that day. Lastly, Chef’s Table is such a private event that it can fill up fast. If you want to experience it, make your reservation early. You can always cancel if you change your mind, but if you do think you might cancel, do it as soon as possible so that someone else can take your spot.